In March, 2006, I gave a slide presentation to the Chamberlain Civil War Round Table in Brunswick on Maine’s Civil War monuments. In accepting this invitation to speak, I assumed my assignment would be made easy by the 1965 publication Civil War Memorials Erected in the State of Maine, which had been compiled by Maurice J. Warner, the chairman of the Maine Civil War Centennial Commission. Warner illustrated 74 monuments and provided useful text, but it quickly became apparent that the list was not complete. Thus, in the spring of 2006, I set out to locate and record as many of these “silent sentinels” as possible. Four years later the number stands at 148 and is still growing. The journey in search of how Maine communities memorialized their participation in the Civil War has taken me from Kittery to Caribou and from Bethel to Eastport. Monuments range in age from Bangor’s, erected in 1864 while the war was still in progress, to Lisbon in 1999. Many of these tangible expressions of patriotism feature standing Union soldiers sculptured in granite, marble, or bronze, while others are stone shafts on square pedestals. Many inscriptions bear witness to the fundamental reason for the four year conflict which divided the nation: the preservation of the Union at all cost. In first presenting this inventory of Maine Civil War monuments as a website rather than as a publication, I want to encourage the interactive participation of the public. I have not found all the answers, and I welcome your input to make this the best survey possible. If you know the location of a memorial which I have not included or if you have more information, corrections, or pictures relating to one that is listed, please email me at earle.shettleworth@maine.gov or call me at 207-287-2132. This website is part of a larger effort by the Maine Civil War Sesquicentennial Committee and other organizations to observe the upcoming 150th anniversary of the state’s participation in the Civil War. By Executive Order 26 FY 08/09 on March 9, 2009, Governor John Elias Baldacci established this Committee, which is chaired by the State Historian and comprised of representatives from eight state agencies. The Committee began its work this spring to identify and support a variety of projects that will contribute to a broader understanding of our Civil War heritage in this state. In closing, I want to thank William B. Jordan, Jr., Thomas McDonald, and Marius B. Peladeau for their knowledge and assistance in accomplishing this project. I am especially grateful for technical help received from Thomas Desjardin, historian for the Bureau of Parks and Lands and Christine Norris, administrative secretary for the Maine Historic Preservation Commission. In 1859, on the eve of the Civil War, Bangor was a city of 14,432 inhabitants. Its location was described as unusually good for the growth of a city, and its business advantages are immense. Its site is pleasant, commanding fine views of the rivers and the adjoining country. The buildings, both public and private, are constructed with neatness and taste, and some in a style of superior elegance. There are several handsome church edifices and other public buildings; and within a few years several new and elegant blocks of stores have been erected, and many splendid and convenient private residences. Bangor has an extensive coasting trade, which has greatly increased within the last few years. It has also a large southern and West India trade. The river at Bangor is sufficiently deep to float the largest vessels, the tide rising, on an average, sixteen feet. Lumbering forms a very large and important branch of business. The amount of lumber surveyed here, up to the close of the year 1855, according to the books of the surveyor-general, amounts to 2,999,847,201 feet. Like so many Maine cities, towns, and villages, Bangor responded with patriotic zeal to President Lincoln’s call for troops in the spring of 1861 as war broke out between the North and the South. Notable among its contributions to the war effort was the famous Second Maine Regiment, whose own memorial stands nearby. The death in battle of a Bangor resident, Colonel Stephen Decatur Carpenter, in December, 1862 prompted local citizens in 1863 to designate a lot in Mount Hope Cemetery as a resting place for Colonel Carpenter and other Bangor men who would sacrifice their lives for the Union. To prominently and permanently mark this lot, a committee comprised of Charles Stetson, Samuel H. Dale, and S.P. Bradbury raised $3,500 to erect a tapered granite shaft upon a square base, Maine’s first Civil War monument. 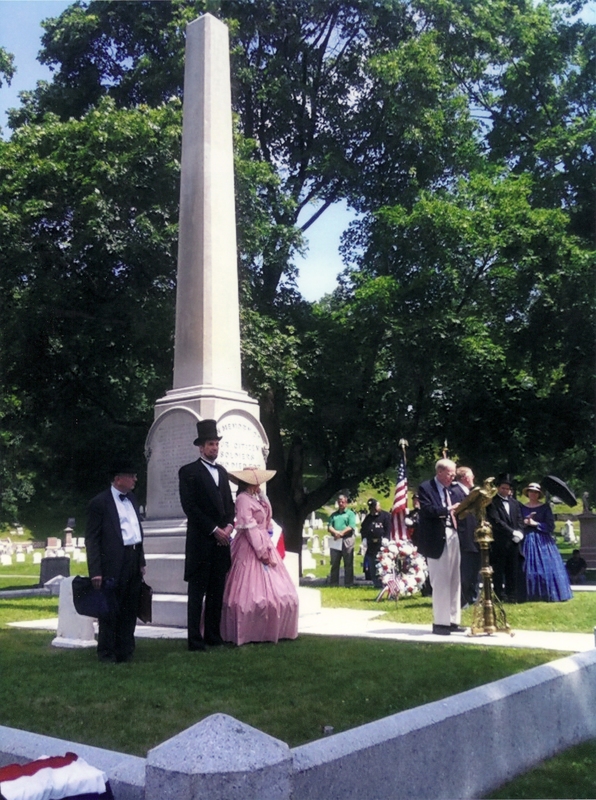 Dedicated with great ceremony on June 17, 1864, Bangor’s new monument set the style for the first wave of such memorials in the state, which included Hampden on July 4, 1864 and Kittery that year as well. Between the close of the Civil War and the beginning of World War II, more than 150 Maine communities created monuments of many forms in tribute to those who served the Union cause. Your invitation to me to be present with my staff on the 17th, upon the occasion of the consecration of the Soldier’s Monument erected by the citizens of Bangor, has been received. I have delayed a reply, hoping to be able to do so affirmatively, but the pressure of official business and antecedent engagements admitting of no postponement, compel me to decline it. 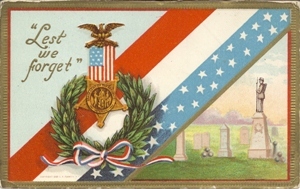 To render due honor to the glorious dead who have laid down their lives a sacrifice for their country, is a duty and pleasure to every loyal heart, and nothing could have afforded me greater gratification, than to have been present with you on this most interesting occasion. That Bangor should be the first place in Maine to rear a monument to all the fallen soldiers whom she has sent forth to battle is a credit even to her liberality, which is ever timely. The example she has set well deserves, and doubtless will be extensively followed, but the rendering of these posthumous honors ought not to be trusted to the accident of private generosity. It is a public debt, and it should be made a public duty to be executed at the public charge. To rescue from this oblivion, every municipality should be required to erect a monument in its cemetery to its own illustrious dead. Let it be a plain shaft, as enduring as the granite of our hills, and on it let there by inscribed the names of the fallen heroes. In this manner the memories of all may be preserved, for every house knows its own martyr. These monuments, thickly scattered over the State in all time to come will be witnesses of the enormous sacrifices which Maine has made in the prosecution of this war for the preservation of the republic. They would be cherished with affectionate pride by all future generations and when perils hereafter assail the nation, the patriot, casting his eye on these shafts, will gather fresh inspiration, and, emulating the heroic examples they commemorate, will gird himself with a sterner resolve to do all and dare all to avert from his country the menacing dangers. As a historian, it is a special experience for me to come to this sacred spot 145 years after its initial consecration to find so little change and so much respect having been accorded this monument and its surrounding graves. How well this speaks of generations of Bangor citizens and in particular of those who have been entrusted with the care of Mount Hope Cemetery, Maine’s answer to the famed Mount Auburn Cemetery in Cambridge. I have asserted a firm conviction – a conviction rooted in my faith in God and my faith in the American people – that working together we can move beyond our old wounds, and that in fact we have no choice if we are to continue on the path of a more perfect union. Maine State Historian Earle G. Shettleworth, Jr. speaking at the Bangor Civil War Monument, Mount Hope Cemetery, July 11, 2009.